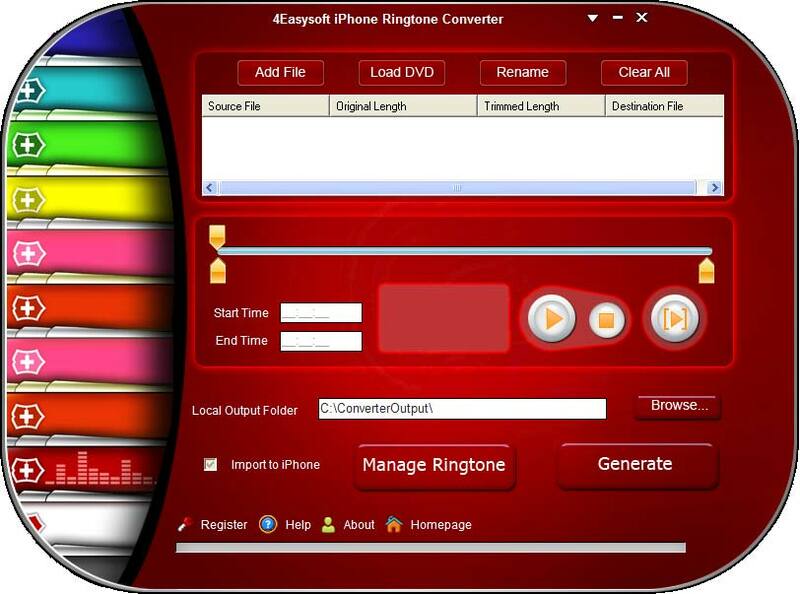 4Easysoft iPhone Ringtone Converter, helpful ringtone converter for iPhone, iPhone OS 3.0/3.1 makes it easy to create or convert iPhone ringtone. With this iPhone Ringtone Converter, no matter the source is video or audio, it can transfer it as iPhone ringtone. To meet your needs, 4Easysoft iPhone Ringtone Converter assists you make iPhone ringtone from concert recordings, MTV albums, even DVD sources. And iPhone Ringtone Converter supports formats like MP4, H.264/AVC, AVI, MPEG, WMV, DivX, MKV, RM, MOV, MP3, WMA, WAV, AC3, OGG, RA, M4A, AAC and more. Plus, this iPhone Ringtone Converter, or iPhone Ringtone Creator works to transfer only part of your video/audio as your iPhone ringtone, then export to iPhone directly. You are also available to manage your iPhone ringtone, like remove your existing iPhone ringtone, or remove it. Includes 4Easysoft iPod Manager and iPhone Ringtone Converter, which can rip iPod/iPhone to PC, Import local files to iPod/iPhone directly, transfer between iPods, between iPhone and convert any video/audio files to iPhone ringtone M4R, then directly export to iPhone. 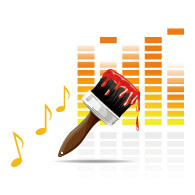 4Easysoft iPhone Ringtone Converter owns the solution to convert audio, like MP3, WMA, WAV, and M4A to iPhone M4R ringtone. 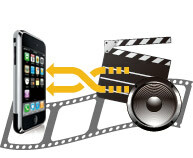 Ability to extract audio from video and transfer it as iPhone M4R ringtone, it supports video formats like MP4, H.264/AVC, AVI, MPEG, WMV, DivX, MKV, RM, MOV, etc. The competence of converting MTV albums, concert recordings, and other DVDs to iPhonr ringtone. 4Easysoft iPhone Ringtone Converter makes it practicable to transfer only part of your video/audio as iPhone ringtone by dragging and dropping the slide bar or inputing the start time and end time. Check "Export to iPhone" to load your converted ringtone in your iPhone directly. With this iPhone Ringtone Converter, it allows you to pre-listen the sound effect to make sure it is you want to convert ringtone. 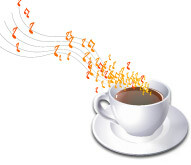 Two click to finish your iPhone ringtone creation and it designed for beginners, easy enough for everyone. Convert concert recordings, MTV albums, even other DVDs to iPhone M4R ringtone for your enjoyment. It's convenient to convert several files at the same time. How to make your own iPhone Ringtone on Windows/Mac?